I mean, just look at them. Sure, one’s a heavily armored angry dude and the other is a space alien with glowing red eyes that are about to shoot out hot laser beams of death. But still, babies! 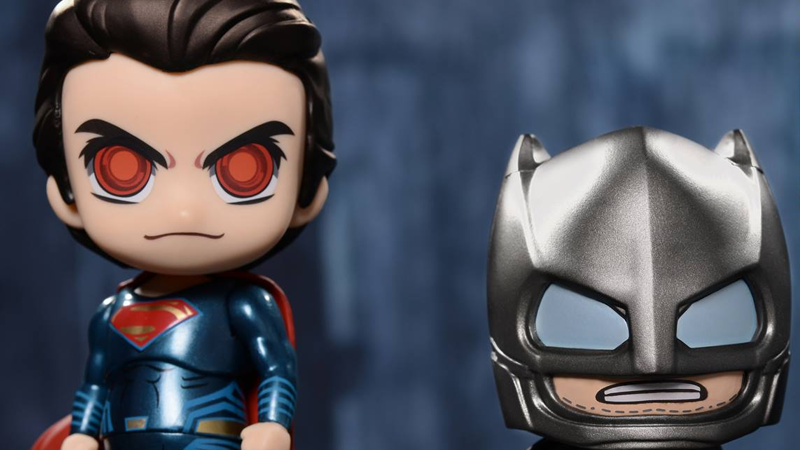 Hot Toys have unveiled the cutesy little “Cosbaby” toys as the latest in their line of Batman v Superman products, and the first set will be a twin pack of Bats and Supes duking it out... for the title of “Cutest DC cinematic hero” rather than anything else. As they’re meant to be battling, this is Bruce in his heavily armored Batsuit rather than his usual gear (complete with a hilarious expression of his gritted teeth), while Clark’s eyes are blazing red as if he’s readying a blast of his heat vision. Even in these angry forms, these 3.75” tall figures still just look cute as hell in these super deformed style sculpts. They come with a few tiny accessories to set the scene: Batman’s Batsignal, and Superman is attached to a special stand to make it look like he’s floating in the air. No word on when these two will be available, but presumably it’ll be in the summer, given the usual Hot Toys annouce/release cycle. They’ll likely cost around $60-80, because, like all Hot Toys products, they’re exceedingly pricey.